Now I know why the St John is shorter than the St Matthew! It doesn't really bother me that the St Matthew Passion is so long though because it's such a great, beautiful work. Yes, if Bach had included the Last Supper section of the St. John Gospel in the JP, this composition might have taken two days, instead of two hours! It includes all the parables Jesus told that night, and also the washing of the disciples' feet. That's why the reading and/or singing of St. John's Passion story has to take off immediately with the Gethsemane Garden and the captivation. Dramatic action guaranteed! Order MUST occur in 24 hours....I need to hear this piece! Let's forget about my personal faves .... and try to be 'objective'. You began this thread with a pic of Herreweghe 2: avoid it, not because it's bad, but because it's the 1725 version .... without the introduction chorus Herr, unser Herrscher!. The SJP is some kind of an orphan without it, IMHO (very objective, this!). This chorus is indeed my favourite Bach piece. Is Herreweghe 1 still available (with a.o. Howard Crook as Evangelist)? This offers the 'standard' version, isn't very fast and will probably answer to your personal taste, because you already liked H. in the SMP. I like Gardiner, but if you're not a great fan of his Bach: avoid. I like both Harnoncourts, too. His first recording might be a bit challenging for non-HIPpers though. All boys, and sometimes not-entirely-secure tuning of instruments. His second recording, with Anthony Rolfe Johnson both as evangelist and aria singer, is more straightforward. The recording sound is a bit direct, though (almost no reverberation). Harnoncourt is also visible on DVD somewhere: again all boys, no perfect tuning, but with the best evangelist of all time (of course this is a totally objective opinion): Kurt Equiluz. When you look at him singing, you realize he's not to be trifled with! When you listen to him singing, he'll certainly make your blood run cold! Hermann Max (like Harnoncourt 1, also mentioned by Que) is very good IMHO, but also very fast. It doesn't bother me at all though, because (as in his SMP) he avoids to sound hasty. Masaaki Suzuki is quite OK, too. But he doesn't make me 'scream and shout' in this composition, I must admit. Not to forget: Ton Koopman! I think his studio SJP is far better than his studio SMP. It might be the one for you .... you see: it's really an easy choice! About non-HIP I really can't say anything, except: maybe Peter Schreier, or Helmuth Rilling's second recording will answer to your wishes! Schreier offers some alternative aria's from the 1725 version, Rilling offers a lot more of that. Buy the Kuijken/Leonhardt double passion CD box set. And also buy the Harnoncourt DVD. Both watching Harnoncourt conduct, hearing some boys sing very well, and .... watching and listening to Kurt Equiluz .... well, it has proven to be quite an event for me! That is what nixed it in the end for me. I would like to have that intro for my intro recording. Bach also composed a St Marc and a St Luke passion. Semi-reconstructed recordings exist on Brilliant. From Wikepedia...where the writer does not accept the possibility. There survives a manuscript of the St Luke Passion from about 1730 that is partly in Bach's hand, though the academics believe that the music is certainly not his own. Presumably Bach performed it, or intended to perform it, in Leipzig. C. P. E. Bach and Agricola may have mistaken it for a work of Bach's and thus included it in their census. Of course, given his delight in exhaustive cycles, Bach should have composed a St Luke Passion. Apparently J. S. Bach took the anonymous St Luke Passion and arranged it for four voices, chorus, orchestra, and continuo to meet an urgent deadline for Good Friday in 1730. I saw those as well, Mike. May be interesting to hear. But are St Mark Passion and St Luke Passion as authentic as Beethoven 10th? It's surprising that CPE Bach would not know his dad's work. They wrote music together. He has performed his papa's work in concert. It's a little odd. According to a necrology of CPE Bach, Bach wrote 5 passions. We know the SJP and SMP. The St Mark is known, because the lyrics have survived. He composed a passion oratorio in his Weimar period, for the county of Gotha (this one got lost, but one thinks that maybe 'O Mensch, bewein dein Sünde groß' was part of it, and also some arias that returned in the 1725 SJP version). Did Bach compose a St Luke Passion? There is no evidence of that. We do have this St. Luke manuscript though, with 2/3 in the handwriting of CPE, and 1/3 of JS. But believe me: one doesn't need to be an academic to hear that this SLP is NOT by JS Bach himself. He only arranged the final chorale of the first part of this Passion, which is believed to be composed by Johann Melchior Molter (1696-1765). Best recording I've heard (I know only two, btw): Wolfgang Helbich conducts the Alsfelder Vokalensemble & Barockorchester Bremen. Rufus Müller is evangelist, and Stephan Schreckenberger sings the bass part of Jesus (not bad, both of them!). Label: CPO. The music of the St Mark Passion is lost, but the lyrics of Picander have survived. It is to be believed that many of the arias are 'parodies' of arias of the Trauer-Ode BWV 198. Good recordings: Roy Goodman conducts the Ring Ensemble of Finland and a European youth orchestra. It has a very good treble in the soprano parts, only problem is: he's not singing German at all! Label: now Brilliant Classics! I also have a recording where a reconstruction of Bach is mixed with modern music of the composer Volker Bräutigam: interesting indeed! Christian Pfeifer conducts the Kantorei der Bergkirche Wiesbaden & the Capella Montana choir. Did Bach compose a St Luke Passion? There is no evidence of that. We do have this St. Luke manuscript though, with 2/3 in the handwriting of CPE, and 1/3 of JS. 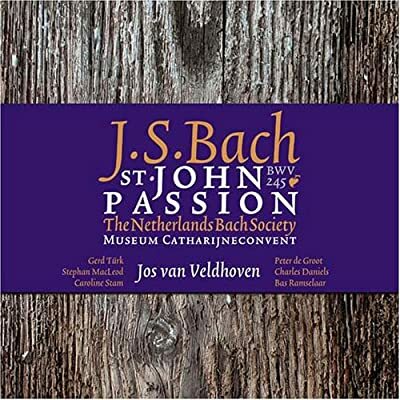 But believe me: one doesn't need to be an academic to hear that this SLP is NOT by JS Bach himself. I once read that Brahms said, after the discovery of the manuscript and all the excitement going along with it: "This St. Luke Passion composed by Bach? Sure, when he was still wetting his bed!" I have both Luke and Marc....but to my ears they just don't hang together at all. Also, they are so speculative and tentative, I have really no idea who I am listening to and I have basically neglected them. .... but to my ears they just don't hang together at all. Also, they are so speculative and tentative, I have really no idea who I am listening to and I have basically neglected them. Koopman tried to 'hang Mark together'. Avoided the Trauer-Ode and came up with entirely other choices, and he composed the recitatives himself, in Bach's style. In the end: it was a performance of the St Mark Passion of T. Koopman, with some add-ons by Bach. Anyway: he did not hang it together, either. Back to topic then, the SJP. And let's wish Bogey well with his choice(s)! Will be a single choice, Marc. Probably the Kuijken, with a much later purchase of the Herreweghe....unless I blink. No notes whatsoever, which is partly why they sit there looking at me and don't get out much for a play. All I have is the aritsts and track listings. Spelling corrected here they are. No notes! Yikes. Does the Kuijken set have a decent set for the St. John? If no one's going to second this one, I will! Gorgeous hybrid version with 'ripenists' augmenting the nearly OVPP approach giving the work added strength in the choruses (my preference). Veldhoven is also a master colorist, perhaps more so than any other HIPster I've heard. Bill, I urge you not to overlook this version while sampling. The fact it isn't getting many rec's isn't a reflection of its quality - it's just something of a "new kid on the block" compared to other veteran recordings. Thanks to this thread this afternoon was a better one for me, listening to this work. God knows I'm not an envious person, but how I'd wish to have a beautiful voice to sing the aria “Mein Jesu, ach! Dein schmerzhaft bitter leiden…” or “just” to play the violin part (AMDG). It quells the pain of sin. It makes me free from hell and death.